I recently upgraded by Instax Mini 8 to the Fujifilm Instax Mini 70 and I gotta tell you, it’s amazing! Not only are the pictures sharp, but it even has a self timer and selfie feature. Completely life changing, especially for those fun group shots! If you’re just getting the camera, snap some photos! It would even be a cute idea to take pictures during a holiday party and fill up a wreath as the night moves along. Wrap the tinsel around the wire frame. You want to avoid any overlap so the wreath doesn’t become bulky. Since the corners are pointed, I recommend cutting a separate smaller piece of tinsel to weave in after you’ve finished wrapping. Clip your photos in place, add some ribbon and you’re ready to display! So fun, don’t you think?! 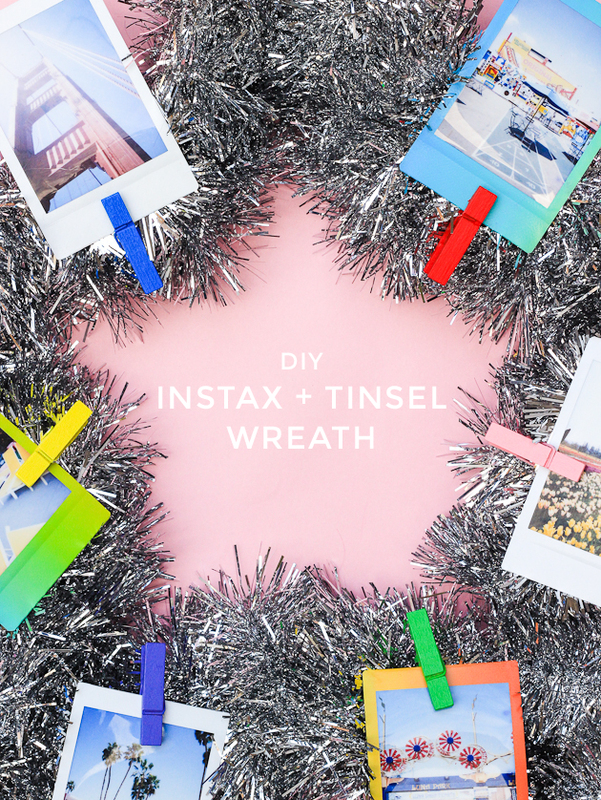 And if you use silver tinsel like I did, you can very well leave this wreath up all winter long. This post was sponsored by Fujifilm. All opinions expressed are my own. Thanks for supporting the brands that keep The Crafted Life making! I LOVE this DIY! What a brilliant idea! I’m always wondering what to do with my instax captures and this is such a fun way to display them! Love it love it love it. The little christmas trees are divine. Where did you get these from? Can you tell me who your supplier of the Star wire frame please? I found it on Amazon! But you should be able to find something similar in the floral section of the craft store I think!